A special reception was held in Pride House earlier in August where one of Scotland's newest Pride events announced a date for their first ever Pride to take place in East Lothian. Pride Saltire Chair John Johnston announced that the 2019 date would be Saturday 11th May with the location confirmed as the grounds of the beautiful Cockenzie House. John was joined at the reception by Councillor Shamin Akhtar who spoke about East Lothian Council's commitment to LGBTI equality and the desire of the council to support the new Pride movement and see it succeed. Walter Gaffney, Scotland LGBT co-convenor at Unison also spoke at the reception and paid tribute to the work of John and other community activists in East Lothian who have been responsible for developing the event so far and urged the wider LGBT community to recognise the need to support movements in more rural and disparate areas. 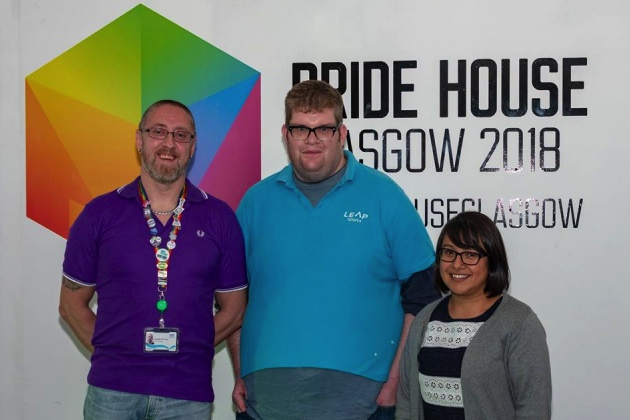 Photo left to right: Walter Gaffney of Unison, John Johnston of Pride Saltire, and East Lothian Councillor Shamin Akhtar at Pride House. Written on 27th August 2018.